Are you looking for a suitable gift item for someone special? 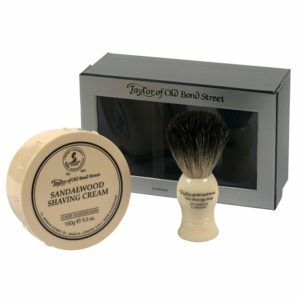 The Taylor of Old Bond Street Pure Badger Brush and Sandalwood Bowl Gift Box Set would be a great selection for any man. The dual combination of a shaving brush and crème will set you up with what you need for a great straight shave. Let us have a detailed review of the product so that you can have a better idea. The shaving brush is made up of pure badger hair with imitation ivory handle and ensures proper applications all over the face. It is of a long-lasting and durable quality. The shaving cream weighs 150g and is sufficient for many shavings. The creme is of sandalwood and cedar wood fragrance and thus makes your shave more refreshing. Both the products are extremely skin-friendly. They are packed in a stylish box with a lid attached to it, which would be perfect for any holiday or birthday gift. Taylor Family has been making fine products since 1854 in England. The dimensions of the product are 1 x 6.7 x 2.6 inches. The shipping weight is 12 ounces. It uses the ingredients like sandalwood aqua, stearic acid, Myristic Acid, Potassium Hydroxide, Coconut Acid, Glycerin etc. It is from the reputed brand Taylor of Old Bond Street. The ingredients used are mild and do not produce any adverse effects on the skin. The lather is formed easily too. It adds a feel-good factor to your daily shaving experience by making your skin feel soft and adding a charming fragrance to it. It has to be mentioned in this respect that the smell of sandalwood is not like the incense-type sandalwood smell that we are used to. It is rather a milder one. It is shorter is height as compared to the other commonly available brushes in the market and is thus ergonomic to be handled. One brush load is heavy enough for shaving the beard all over your face. Since it is already packed in a gift box, you do not have to worry about the presentation for gifting. It forms lather easily and thus helps in saving more of the cream and also the amount of cream taken. This is due to the badger brush which creates a better lather, because it holds more water than a synthetic brush. Getting both these items at around £28 is a great deal since you will find the two individually at a much higher price. There a only a few negatives reviews of this item, but there is no lathering bowl. It is needless to say that the brush and crème combination is a great item to be bought for yourself or to be gifted to someone. Its ease of application, faster lather formation and sweet sandalwood fragrance sets it apart from the rest. Get hold of it today!